You can prevent interference by taking the power supply for the CB straight from the battery, rather than from an accessory socket or the fusebox. This can avoid some of the crackles & whines that the machines electrical loom can pick up, as well as allowing you to use the CB whether the ignition or engine is on or not. We can also supply an Interference Filter that goes in the red and black power lead between CB and battery - it is a simple small black box designed for bulkhead mounting, with two wires in and two wires out. Always try to keep your power and antenna cables away from any other wiring in the machine - this will deffinately help reduce interference. Another way is to use aerial (coaxial) cable for the power feed, instead of the standard black & red cable. You can pass the positive up the middle, with the negative up the braid, or even better, use two lengths, and just use the centre conductors of each. These consist of either a 3m or 6m twin RG8 - black and red, with blade fuse and ring terminals for battery connection. The blade fuse is there to protect against any short circuit should the RG8 twin lead get damaged, if using this method you should always keep the inline fuse in the set's power lead intact, to protect the set. All aerials need a "earth" or "ground plane" to make them work correctly - usually this is made with a metal-to-metal connection with a metal part of the vehicle, but this can allow some interference through, so our Artificial Ground Plane allows you to isolate the aerial from the vehicle whilst still having a good ground plane to ensure it works correctly. Placing a CB in the roof can be a good place, although if you have air-con systems up there, it might pay to do the above check - just in case there is noise coming from the air-con unit, as these are notorious for giving interference. I most cases you'd do best to keep the CB and all cables as far away from the air-con as possible. Does the noise only happen when you are doing a particular job with the machine, or using a power-take-off, or do any fans, pumps or motors seem to trigger it? Switch off your air-con... does the interference go away? Does the pitch of a whine or speed of any ticking sound vary with engine speed or work effort? Does it happen in a certain location? Does it happen at regular times in the day? Also remember that Interference can be given out by all manner of electrical systems commonly found on farms - flourescent tubes, refrigeration and pumping systems, irrigation systems, overhead and underground power lines, even metal grain silos have been known to cause interference. To trace the source of interference in a particular machine, start with the engine and ignition off, along with all other mechanical and electrical systems. Turn on the ignition without starting the engine and listen for any interference - sometimes fuel pumps, preheaters and other motors and circuits activated by the first position on the ignition can be a cause of noise. Start the engine, and operate any mechanical and hydraulic systems one after another, listening for the one thats causing interference - hopefully you can track down where it's coming from, and can go from here. Sometimes cooling fans and similar can be the cause of interference, so check these when the are on too. 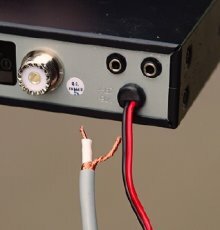 Make sure that your power and aerial cables dont run close to the interference source - re-route your aerial lead if necessary. If you have already made sure that your power feed is direct from the battery, try finding how the interference causing item is powered - it may share a battery terminal with your feed. Check that the earth bonding is all still in place - check with the machine or vehicles manufacturer regards this. 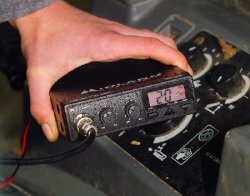 You might need to supress certain circuits individually - usually done with a capacitor or choke placed on the power connections for the item in question (fuel pump, etc). Again, your machines manufacturer should be able to help here, but get in touch with us if not.